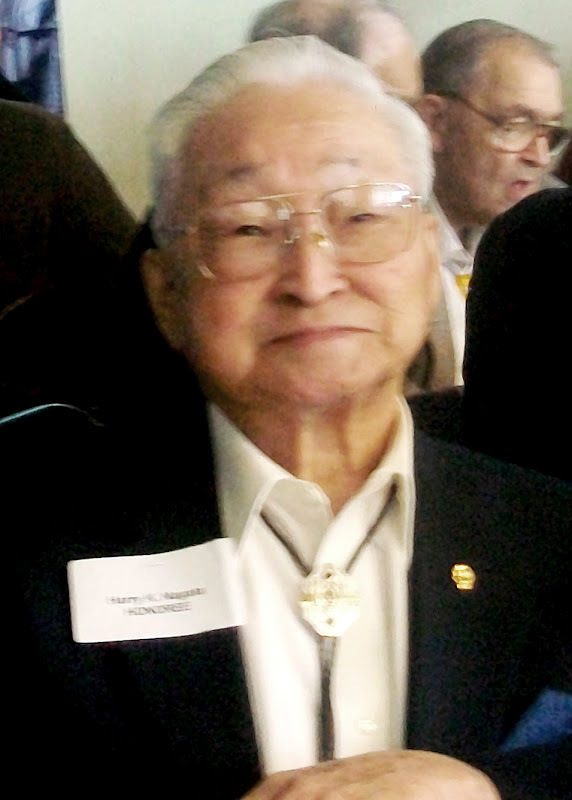 HARRY NAGATA and his family beamed with joy on Sunday after he received a bronze replica of the Congressional Gold Medal for his service in World War II. It was the first big award that Nagata has received for his work as an interpreter and interrogator for the Military Intelligence Service between 1943 and 1945. "I am honored to be honored," Nagata, 90, said. "It's something that only happens once in a lifetime." Nagata and nearly 50 other Japanese-American World War II veterans and 65 surviving spouses and family members were presented with the medals at the 2012 Day of Remembrance Luncheon in Clovis. About 700 people attended the event, an observance of the 70th anniversary of Executive Order 9066, issued by President Franklin D. Roosevelt in 1942. The order led to the forced internment of more than 120,000 Japanese-Americans, mainly those living along the West Coast, after Japan's surprise attack on Pearl Harbor in World War II. The Central California District of the Japanese American Citizens League, which organized the event, used the observance as a chance to honor living and deceased veterans from the central San Joaquin Valley. The medals they presented were modeled after the national Congressional Gold Medal -- considered, along with the Presidential Medal of Freedom, to be the highest civilian award in the United States. Dale Ikeda, co-chairman of the luncheon, attended a ceremony in Washington, D.C., in November, where Congress awarded the national gold medal to Japanese-American veterans nationwide for their service. Ikeda, a Fresno County Superior Court judge, was so moved that he wanted to give individual medals to local veterans, too. His father served in the military intelligence service. The younger generation wished to honor the Nisei, the second-generation Japanese-Americans who fought in World War II, Ikeda said. "Their sacrifice paved the way for a better life for their families," he said. MAS NAKAMOTO, 83, of Fresno, sat quietly after the ceremony watching families take pictures and friends congratulate each other. "I don't quite feel I deserve this honor," said Nakamoto, a retired biochemistry professor who was a translator during the war. "I feel uncomfortable because there were others involved in combat. I'm basking in their glory." KAY KOBASHI, 88, was reserved as well. The war happened 70 years ago, said Kobashi, who owns a tree fruit farm in Parlier. "We were honored already," said Kobashi, a staff sergeant who served as a scout. But his daughter, Carol Guerra, disagrees. "It's very nice for all the veterans because they richly deserve this," Guerra said. "I just wish the people who passed were able to see it, too."